Thoughts from the 4th Grade Mustangs: What do you think of Mrs. Barnsworth? I like the chapter ''Good Bye Rose'' the best. After this chapter the whole story switches subjects. Get ready-It's about to switch again! An adventurous episode is coming! We read a new chapter tomorrow! It has adventure in it! My Favorite Chapter Is when Mrs.Barnsworth, Mr.Barnsworth, and Luella are introduces in the story. Why do you like that one? The Barnsworths are "interesting" people. I kind of hope that Luella gets to run and bounce and go barefoot a little more! I hope that she gets to run around like mule deer and instead of saying yes mother, I hope she says no mother. I am also really exited to read the chapter!! I like that because they are resembling racism back then. @ Jeremiah-I think saying "No" to her mother now and then might be a good idea . . .
What did you think of the new chapter? I agree. If Luella is saying: "Yes, mother," for her whole life, she'll never get to make her own decisions. Also, the chapter was pretty good. I wonder when someone is going to challenge another. Luella has a limited vocabulary. I love that chapter too!! But that is why is is called the ADVENTURES!! I hope you love the adventures Pearley still has in the next few chapters. is Chen Ho being accused of stealing a diamond bracelet and being jailed. Chen was so hurt, he cried himself to sleep. We need to learn as much as we can so we can avoid ignorant actions. Good job Annie! I like how you said that Mrs. Barnsworth is an ignorant woman which I totally agree with. Great job Annie! I like the way you included lines directly from the book. Good Job, but Mrs. Barnsworth did learn her lesson at the end. She apologized and said she was wrong. So, you can't just say she is ignorant (Even though she is) when she has changed a little too. But, overall, Nice work!! Good work Annie!I like your topic sentence and conclusion. Good job! I like the detail and the text that you put into it when you said she was ignorant. I...I LOVE IT!!! Your conclusion is very strong, Annie. It teaches a great lesson. Great way to end your blog! Your opening and closing sentences are strong.but when you say Chen was hurt do you mean physically or emotionally? That is a great question, Jackson! Remember when I told you the story about when I saw a man in a wheelchair? Sometimes we miss out and are ignorant because we don't stop to respectfully ask about someone's story. Sometimes it is because we are fearful that they will think we are being nosey. Sometimes it is because of pride or a lack of humility. I think Mrs. Barnsworth was a prideful person who learned a lesson about prejudging someone else. In the end it looked bad on her. I think Pearley also judged Luella because of her shoes and all the buttons. He wasn't prideful, but he assumed she was like her mother, Mrs. Barnsworth, without getting to know her. What is comes down to is treating each others the way we want to be treated. Kindness still makes a difference. Great discussion! I like Mrs. Barnsworth now because learned and changed, but I didn’t like her before because she was a racist and full of herself. In chapter 10 she falsely accused Chen because he was Chinese – this is racist. Mrs. Barnsworth was a bragger, always making herself look good. She tried to make Luella look good, but only because she wanted to look good at parenting. Now I like her because Mrs. Barnsworth because she admits when she’s wrong and apologizes. She’s not as racist. She brags less. Now she’s better, because she asks for forgiveness, and does what she can to improve. She’s sad and sorry. She made a huge change and learned to try not to be as racist! I didn’t like Mrs. Barnsworth because she was mean, rude, and racist, but I liked her later because she learned and changed. Good job Elijah! I like the way you had Mrs. Barnsworth's personality change at the end. Nice work. I like that you recognized her kind heart in the end. Again good work. Nice Elijah! Good job. Overall, I agree with you. Great work Elijah!I agree with you when you said she is racist.Good job! Great job Elijah! I totally agree with you when you said she tried to make Luella look good just to look good at parenting. Good job elijah great details. NICE!!! I like that you had a half of when she was bad, then the other half when she changed! Keep up the good work! You have good evidence for "both" Mrs. Barnsworths, Elijah. It's great to see that you recognize the change she made. You have many strong details and a great conclusion. Good job Elijah. Can you image how much happier Mrs. Barnsworth's life was from then on. I love that you recognize someone can change. Mrs. Barnsworth behaves like a selfish and judgemental person, but as chapters 9-12 evolve, we see she is lovely on the inside and outside as well. Mrs. Barnsworth is a very wealthy woman. She thinks other people don’t matter and acts that way too. Chen Ho, a young chinese boy, was falsely accused by Mrs. Barnsworth of stealing her bracelet, just because he is chinese. She also said “Chinese are not very intelligent people.” Even after doing all this she made her own husband stand in the sun while she and her daughter stood in the shade. But, as chapter 12 continues, we see a different side of Mrs. Barnsworth. She even said, “Please forgive me. I have behaved badly. I have learned an important lesson, indeed, and need to make several apologies." This shows even if she didn’t change all the way, she realized she was wrong. Mrs. Barnsworth was a selfish and judgemental person, but in the end, she learned a very important lesson, indeed. Great work, Michaela! I really like your topic sentence and conclusion. Good work, Michaela!You had a strong conclusion! Your topic sentence is great in that it allows you to discuss a great many topics, Michaela. Good, strong opening and nice ending in that you see that she has changed. Nice work Michaela. I love your strong topic sentence. It shows a great lesson. Good job, Michaela! I liked your conclusion, especially when you said she learned a life lesson, changing her forever. Nice work! Michaela, I was impressed with the number of quotes from the text you used. Your conclusion was very strong. In my opinion, Mrs. Barnsworth is a good person. She has changed in chapter 12 by regretting the mistakes she previously made. Mrs. Barnsworth gives people commands, like her daughter, Luella and her husband, and I get it, she is trying to set a good example for others. when she was being racist, rude, and judgmental, she was sorry and she will apologize to everyone in the town. You cannot judge people by first impression, you need to get to know them in order to decide if they are good or bad. I like the ending of the blog, Kris. I agree that people need to know each other before concluding ideas about them. Good ending to your piece. Good job! Mrs. Barnsworth did learn a lesson in the end. I like how you mentioned that! I like the way you addressed the part about Mrs.Barnsworth commanding her family members. Nice Job. I like that you encluded that Mrs. Barnsworth commands a lot. Nice job! I agree that Mrs. Barnsworth is truly a good person. I really like how you said that you need to know someone to judge! I have a hard time thinking that Mrs. Barnsworth was a very happy person until she was humbled. I love that Luella was also able to see that change in her mom and that her and Pearley became friends. The other thing you did with this blog Kris is what authors refer to as a take-away. You took the topic in the blog and then turned it to something relevant to the readers. Instead of going back to what Mrs. Barnsworth learned you said, "You cannot judge people by first impression, you need to get to know them in order to decide if they are good or bad." This allows the reader to take something from the story and apply it to their own lives. Being able to do that will really help you in your writing. Great job. I do NOT like Mrs. Barnsworth because she is judgmental. She is judgmental because she judges people on what their culture is. She thought Chen was a thief, just because he was eyeing her jewelry. Also just because Chen Ho was a Celestial (what Chinese people call themselves because they live in China which they call an enchanted city) she automatically blamed him when her bracelet was stolen. But what Pearley found out when he and Luella were trying to catch the real thief was that it was a raccoon that stole the bracelet. So the lesson there was that you can’t blame someone because of their culture. Also, she said that Celestials are not very smart but they are hard workers. Just because they’re Celestials doesn’t mean they’re not smart. Mrs. Barnsworth is rude and judgmental, and I do not like her that much in my opinion. Do you??? You've given this some good thought, Elijah! Your details do well to prove the main idea in your topic sentence. Did you change your opinion of her at all after she apologized or did that matter to you? Nice details! Good topic Sentence. Great details Elijah! I agree with you when you said she is judgmental.Good job! Awesome job, Elijah! I really like how you ended with a question! Amazing job Elijah. I love your supporting details. Also, I like that you ended in a question. I have a answer for you: No, I don't like Mrs. Barnsworth like this because it's not nice to be rude and judgmental and it can cause lots of problems. People who have had an easy life don't always understand the struggles and hardships others have had to face. I think Mr. Barnsworth wanted his daughter to experience an adventure for herself so she wouldn't be as judgemental as Mrs. Barnsworth. I am impressed with the comments you are leaving for each other, 4th graders! Keep it up; they're fun to read! You are welcome! I hope everyone who has commented does feel that way! In the captivating novel of The Adventures of Pearley Monroe, by Marci Seither, the character Mrs. Barnsworth discriminates against people who are different than her. When she realizes her mistake, she transformed into an improved and less accusing person. Before Mrs. Barnsworth learned her lesson, she discriminated against people by treating them as if they were less than her based on wealth and appearance. For example, she discriminated against the miners she passed on her way to Coloma from Boston by calling them ‘those leather-skinned miners’. That is an offensive term to use when describing people. Mrs. Barnsworth despised lots of cultures that aren’t her own. Mrs. Barnsworth unfairly accused Chen Ho of stealing her diamond bracelet. Mrs. Barnsworth changed her attitude when Luella and Pearley’s plan worked to catch the real thief because they didn’t think Chen had stolen her bracelet. Their plan was to have Luella wear her sapphire combs in hopes of catching the real thief. When Pearley found the valuables in the raccoon's den, Mrs. Barnsworth changed her point of view because she realized she was wrong to falsely accuse Chen for no reason except for his appearance. 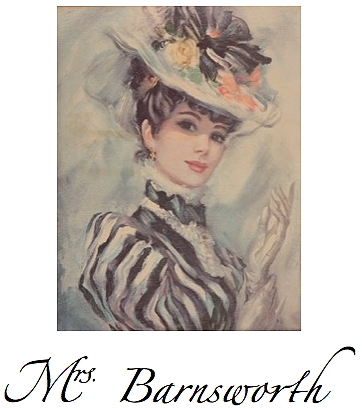 Pearley thought ‘He had been so captivated by her beauty when she first exited the stagecoach upon their arrival, but now, draped in sincere humility, Pearley saw she was beautiful inside as well.’ Mrs. Barnsworth learned not to accuse people because of culture, wealth, or if she has no proof. Mrs. Barnsworth, Luella, and Mr. Barnsworth, a.k.a. Henry, all learned an important lesson not to blame a person if they had no evidence. Mrs.Barnsworth’s personality morphs into a more considerate person. By the time Mrs.Barnsworth returns to Boston, she has changed into a more accepting lady and a kinder human being. Amazing! It sounds like a 10th grader wrote it! Thanks, Michaela! That's quite compliment. Yours is fascinating as well. This is amazing. That is all I'm going to say. Though I could go on and on about how good it was, like you used very descriptive words throughout your blog, and you put good details from the book to prove your big idea . . .amazing describes it all. Great ideas, Naya. You have done well to support your thoughts with text evidence, and you've blended your original thoughts well with the text. Great analysis of the character! Sounds like a 9th grader wrote this. Great job, Naya! You have a nice, long blog! I really like your blog it's strongly worded and very convincing.I mean it convinced me! Amazing Naya. I LOVE your good use of adjectives and adverbs. Your details are very strong. It sounds like a 9th grader wrote this. Amazing blog. Naya, you did a good job in explaining how Mrs. Barnsworth morphed over time. I like your vocabulary and how you gave evidence from the text. One of the most important thing a writer needs to remember is to SHOW readers not just TELL. If I had told you Mrs. Barnsworth was a self absorbed person it would not have had the same impact as seeing her treat others the way she did. I love that you picked up on all the little details that showed you what kind of a person she was. When you are writing a story..remember to SHOW don't TELL. Great job Room 15!! Naya, I also love that you used the word discriminates. Very well thought out and articulate. I think Mrs. Barnsworth is rude and judgmental at the beginning of chapter 9 but by the end of chapter 12 she’s kind of nice. She is judgmental because she judges Chen Ho by what she has heard about the Chinese people. Mrs. Barnsworth is rude when she says the Chinese are hard workers but they’re not smart. Just because someone is from a different culture that doesn’t mean they are dumb. Mrs. Barnsworth also judges Chen just because he’s a Celestial she thinks he stole her diamond bracelet. Just because someone is from a different culture someone else can’t accuse the person from the different culture. Mrs. Barnsworth is rude because she insults the minors from Folsom by calling them ‘leather skinned’ minors. She is also rude when she talked to Susan Chalmers by saying ‘can you fix me a cup of tea or I should say a good cup of tea’ without saying thank you. Mrs. Barnsworth might be nicer and might not be so judgmental and rude anymore. Good Job! But,In your paragraph, It does not say very much on how Mrs. Barnsworth changed. But, It does say she changed in your topic sentence. But, I really like how you worded your paragraph! Again, great job. I liked the way you used lots of quotes from the book. AWESOME job, Eric! Great support for the idea of Mrs. Barnsworth being rude and judgmental, Eric. You have done a good job of showing your idea and connecting it with text evidence. Nice work Eric. I agree that she is rude and judgmental and that she is more nice in the end. Mrs. Barnsworth is complicated. Mrs. Barnsworth is complicated because at the beginning of the whole Barnsworth scene, Mrs. Barnsworth is judgemental, and by the end of the whole Barnsworth scene she is beautiful on the inside as well as the outside (at least in my opinion.) An example of this is when she accuses Chen Ho of stealing her diamond bracelet, and by the end of the Barnsworth scene she admits she is wrong about accusing him. Another example is when she accuses Chen Ho of stealing her diamond bracelet, with only 1 piece of evidence: That Chen Ho had been looking at her bracelet for 5 seconds. Mrs. Barnsworth is also snobby. Mrs. Barnsworth is snobby because everyone she meets she compares herself to them as if she is some “higher authority.” Another example is that when the stagecoach driver is unloading the trunks, Mrs. Barnsworth stops him right there and says, “You shall wait until Mr. Barnsworth comes back so that we may find out if this place is somewhat suitable for me and my daughter. (Notice how she didn’t mention Mr. Barnsworth.) A character in The Adventures of Pearley Monroe, Mrs. Barnsworth exhibits complex personality traits. Complex is a good word for Mrs. Barnsworth. Her changes certainly make her even more complex. In the end, did you like her? You have good points here, Daniel. Nice work. I like that you used many ways to show Mrs. Barnsworth's complexity. Nice job. I love that you pointed out that Mrs. Barnsworth had complex personality traits. She was so strict and stern with Luella. I wonder if that is how she was raised? Sometimes taking the time to see things from a different point of view can help us have empathy for others. Just like how Luella felt when she heard about Chen's family. Great Job Daniel. Elizabeth Barnsworth is the most unlikable character in The Adventures of Pearley Monroe by Marci Seither. She is judgmental and racist, which are negative qualities to have. In chapters 9-11, Mrs. Barnsworth is judgmental against Chen Ho. At the end of page 56, the book says,”Pearly could see Mrs. Barnsworth eyeing Chen as he walked away like a cat eyes a mouse right before it pounces.” So, this quote proves Mrs. Barnsworth doesn’t like Chen. Cats do not like mice, and they plan to harm them when they pounce on them, and so it is suggesting to us that Mrs. Barnsworth is planning to harm Chen. Eventually, she does harm him. On page 61, it says,“Chen and his grandfather also stepped out of the kitchen to see what the commotion was about, a fish still in the older man’s hand. Mrs. Barnsworth pointed her finger in their direction. “There he is!” she said accusingly. “There is the little celestial thief who couldn’t stop looking at my jewelry. Arrest him now!” She is accusing him of stealing her bracelet, when she has no proof or evidence. Chen is just looking at the diamonds, which almost anyone would do because they are diamonds and they are fascinating! Mrs. Barnsworth is also judging Chen Ho based on his race, which demonstrates that she is racist. Chinese people came to America to get a better life but they had to take less desirable jobs so they were not very respected. We were lucky to have Marci Seither visit our class to discuss the book. She said that Mrs. Barnsworth is supposed to represent Mrs. Barnsworth as a racist character. When Mrs. Barnsworth discovers that Chen is innocent, she apologizes, so she does have some remorse. However, I feel she is racist and judgmental. When she wants to leave, she says that she wants to get out of Coloma as soon as possible to return to her old ways in Boston. The raccoon that stole Mrs. Barnsworth’s bracelet is an unlikeable character, but I dislike Mrs. Barnsworth even more because of her being racist and judgmental to other people. Good job! I agree that Mrs. Barnsworth is an unlikable character. Very strong topic sentence, Geoffrey. Your details do well to prove that idea, too. With Mrs. Barnsworth's apology, do you think she is the same when she came to Coloma as when she left? Do you think she changed at all? Nice work. I like when you mentioned that quote about a cat and a mouse. Geoffrey, How do you know that Mrs. B is the worst character in the book The Adventure of Pearley Monroe. You haven't even read the whole book.OR DID YOU!dun-dun-dun-dun! Anand is right, there could be a nastier character.Overall Great blog! Nice work, but I dissagree.1:How do you know that Mrs. B is the worst character.2:We have not read the whole book yet, so a more unlikeable character could enter the story.3:The only way to know if she is the most unlikeable character is if you read ahead or you have already read the book. Still, good job. I like your details! Good work, Geoffrey! Mr. La Marr- The sentence should have said, “However, I feel she is still racist and judgmental.” I think Mrs. Barnsworth changed a little, but she couldn’t have changed too much because the only way to stop being racist is to get to know those people. There were not very many Chinese people in Boston at the time, and it is not that likely that she would want to get to know them if there were, so she will probably keep those negative qualities. Friends- Mrs. Barnsworth discriminates against a Chinese kid. I am an Asian-American kid, so how could another character be more unlikable to me? I fully agree with you Geoffrey. Her "change" was so sudden, and it takes much more time than that to remove a racist attitude. Hopefully, she learned something in Coloma that can start a change for her. Your statement above is very well said. Nicely done! Nice Geoffrey! I like your conclusion sentence! I really agree with Geoffrey! I think Mrs. Barnsworth was judgemental of everyone. She didn't treat the stage coach drivers nice, or Susan, or even her husband with respect. She judged Chen because he was a different race. A different color. A different background. Luella even started to pick up on her tone until she took the time to get to know more about Chen. I think when Mrs. Barnsworth realized that she was wrong and saw how much hurt she had caused I think she was sorry for her actions. Sometimes we we get out of our comfort zone it causes us to be hyper critical and I think wanting to go back to Boston was really about going back to where she felt she fit in. That is a great point. I think if you are judging someone based on lack of knowledge you can change if you want to. You feel what the other person feels and it moves you to want to do better. The actual word is REPENT.. It means to "change one's mind". I think that is what happened with Mrs. Barnsworth. I have a story I would love to tell you about something that happened to me. It is about a man that lived in our small town. He would walk over to you, slightly swaying, and introduce himself, "Hi. My name is Woody!" He needed a bath and maybe two baths! He would start talking, pause and then he stick his hand out toward you and say, "Hi. My name is Woody," and start the conversation all over again. What would you think of someone like that? A bit off his rocker? That is what I thought. But when I heard about Woody's story I began to cry. My opinion instantly changed. But...I will tell you the rest of that story the next time I come to visit. Mrs. Barnsworth seemed to have many bad qualities, but in the end, she is really kind at heart. Mrs. Barnsworth was rude when she described the miners in Folsom as ‘leather-skinned miners’. When the stagecoach driver asked Mrs. Barnsworth to put their trunks on the hotel’s porch, she said,"You shall wait until Mr. Barnsworth returns. He is making sure that this hotel establishment is somewhat suitable for our child and myself." This shows that she was snobby. She was also snobby when she said,"Can you fix me a cup of tea? Or should I say a good cup of tea." to Susan, the daughter of the hotel owner. Mrs. Barnsworth was impolite when she called Pearley, a stable boy. She was very mean when she saw Chen Ho, the cook’s Chinese grandchild and told her daughter, Luella, that Chinese people call themselves Celestials because they think that China is an enchanted city. Mrs. Barnsworth also said,"I can’t imagine that they are very intelligent, but at least they are hard workers from what I have been told. And they do know how to make a proper cup of tea." This is insulting towards Chen’s culture because she was judgemental towards a race that she doesn’t know much about. She was also judgemental towards the Chinese people when she accused Chen of stealing her bracelet without any evidence. After that, Mrs. Barnsworth dramatically dabbed her eyes and said,"I knew I should have never left Boston where it is much safer and more civilized. Luella, pack your things. We will be leaving as soon as humanly as possible." From this I can infer that Mrs. Barnsworth was also melodramatic. I saw that Mrs. Barnsworth was really kind at heart at the end of her visit in Coloma. When the real thief, a raccoon, was found, and Mrs. Barnsworth’s bracelet was returned to her, she said, "Please forgive me. I have behaved badly. I have learned an important lesson, indeed, and need to make several apologies." This incident proves that Mrs. Barnsworth was not just beautiful outside, but also was beautiful inside. Mrs. Barnsworth, who had many bad qualities, learned a valuable lesson that she should not judge people based on their color, creed, race, or culture. Good job of looking at Mrs. Barnsworth in multiple perspectives. She seems to be almost two different people: the snobby, rude lady who first arrived in Coloma and the apologetic one who realized her mistakes. You did well to notice that, Samrita! I also think she is kind at heart at the end! Nice thoughts! Hey, Daniel. I have a question about you comment. When you said "COOL! !," what do you mean and why? I think it was good because Sami used a lot of details and that she was really good at proving things, like when she said "snobby" or "judgmental." In all, "WHOO, HOOO!!! DIS WAS AMAZING!!!" I like how you put all your thoughts into your blog and everything you could get from your thinking.You can notice by the length of your blog.Again,AWESOME!!!! Sami your blog is AMAZING!! I like your topic and ending sentences. I really like your blog. Your conclusion sentence is GREAT. AWESOME JOB! Wow Sami! Great job taking each little small scene into consideration. One gain this is a SHOW don't TELL that helps readers make their own decision about what is going on in the story and I can see that you are a very detailed reader! Thanks so much for taking the time to put all of this into your well written blog! I can not wait to see what you write next! I like how you stated Mrs. Barnsworth having bad qualities and then in the end being kind hearted. Mrs. Barnsworth may seem bad at first, but she is good at heart. When one first meets Mrs. Barnsworth, she might appear to be a mean person. That's what I thought, and here's why. First, Mrs. Barnsworth unfairly accused Chen Ho of stealing with no proof he was the culprit. Next, Mrs. Barnsworth was unusually strict and ladylike, so she would gasp and get really dramatic when Luella, her daughter, did something unladylike. But, the good side of Mrs. Barnsworth is that once she realized she was wrong, she apologized very quickly. This characteristic made me understand that she was a person who had more integrity and kindness that I had originally thought. This is why Mrs. Barnsworth was bad at first glance but good once you go deeper. Great look at the whole character, Susannah! I like some of the words you used like "culprit," "integrity," and "gasp." They add to the interest of your post! I agree with Mr. La Marr. Also I like the start of the second sentence because it's very formal way to start the sentence. Awesome job, Susie! I like your ideas Susannah. But,if people hadn't read the book they wouldn't understand it when you said, she accused Chen of stealing her bracelet without explaining the robbery. Great use of words Susannah! Mrs.Barnsworth wasn't very nice since she was introduced in the story, but she proved that everyone can be nice after all when she left. When she found that since she still talked rudely by saying "Or should I say a good cup of tea" to Susan, sort of expressing that their hotel can't make a good cup of tea. She was also very rude to refer someone by their skin color by indicating the miners they saw as they came through Folsom "leather skinned".When she said "somewhat suitable" she is saying that the west of the country is not humane or controlled.She is saying that it may not be "perfect" enough for her.She also said for my child and I and did not include Mr.Barnsworth.She also made Mr.Barnsworth go inside and do all the boring talking while Mrs.Barnsworth and Luella got to see the view. She was accusing Chen Ho, someone she doesn't even know about out of everybody else of being the thief.Couldn't she choose anyone else?She chose someone of a different race and did it one only one piece of what she calls "proof".She also refers Chinese people to "dumb" by saying, "They may not be intelligent, but they do know how to make a good cup of tea. "When Mr.Barnsworth said that she was possibly wrong about her statement, she dramatically dabbed at her eyes and said Boston is much safer than Coloma.She is saying that Coloma is an unsafe place and she should've never left Boston.She referred Pearley to "stable boy" instead of not mentioning him as a noun. It's like she wants Luella to be, well, like a woman. It's like she wants her to be the same and not stand out from other women. It's like Mrs.Barnsworth is trying to keep Luella from being herself.As if she's saying "It is criminal to be an individual! ".Not to mention but Luella says "Yes Mother" a lot Mrs.Barnsworth probably trained Luella to be obedient to her and other adults and do whatever they say.I hope Luella says "No Mother" a bit more. At the end, she finally admitted she was wrong and apologized to Chen Ho and showed that everyone can be kind inside. Great details Brian! I like your topic sentence and conclusion. Good job! You have a great opening and a strong closing, Brian. You're big ideas about Mrs. Barnsworth are ones with which I agree. You have many good details to help prove your big idea. For people who didn't read the book,it would be difficult to understand the part of the blog about the thief because you did not explain the robbery.Other than that I loved your blog because you connected details with your own thinking. Great work, Brian! I like the second paragraph of your blog! @Anand-Your point is true for people who didn't read the book. However, in our critical literacy studies, when we write about books, it is assumed that the reader of the writing has read the book. I love your details! You had strong opening and closing sentences. But I agree with Anand that for people that didn't read the book wouldn't understand the part about the robbery. GREAT JOB, Brian! I really like the way you included all the proof to show that Mrs. Barnsworth was not so nice. Mrs. Barnsworth started out a mean, judgmental, ignorant, and slightly racist woman. Mrs. Barnsworth was mean to Chen, accused him of robbing her and said "I can’t imagine that Chinese people are intelligent but they are hard workers." She is rude to her own husband! That isn’t even all the mean things that she did! In the end Mrs. Barnsworth was sorry and made apologies. Mrs. Barnsworth has learned the lesson of never judging a person by their wealth or race ever again. If you do you could be nailing a nice person. Mrs. Barnsworth wouldn’t have learned this lesson if Pearly and Luella (Mrs. Barnsworth’s daughter) hadn’t proved that Chen did not steal her mother’s bracelet. It was a raccoon. Great work Mahdi! Your ending sentence is funny. Also your topic sentence is good, I like that you incorporated different traits. You have a good, strong topic sentence Mahdi. You also have some good ideas to support that topic sentence. In the end, is she still the way you stated in your opening? A good conclusion could let the reader know what you think about that! As a reader, I want to know if you think she has changed permanently! I agree with Naya. That is so funny! I like how you were very strong with your proof and put lots of emotions. Wow Mahdi! Your last sentence is so funny! Overall, in chapters 9 through 12, I thought that Mrs. Barnsworth was a judgmental character. When Mrs. Barnsworth arrived in Coloma, she saw that nobody was rich, so she believed that everyone was worse than her. In chapter 10, Mrs. Barnsworth jumped to conclusions after being robbed and blamed Chen Ho for it, even though she had no proof. She blamed him because of his culture. He is Chinese and she was not used to seeing Chinese people in Boston. She also judged that the tea at the Sierra Nevada House wouldn't be good enough for her. She changed her judgmental views when she saw that the bandit was just a raccoon, not “That celestial thief who couldn’t stop looking at her jewelry.” She felt bad that Chen was put in jail for something he didn’t do, and she apologized to Chen and his grandfather. I thought that in the beginning she was a judgmental person, but in the end, Mrs. Barnsworth showed that she was a good person inside. Mrs Barnsworth was judgmental until she learned the golden rule and became a better person. Well done, Dylan. Your conclusion does an excellent job of showing the change in Mrs. Barnsworth. I agree that she was judgmental. I wonder if she has changed permanently. I hope so! I agree with Mr. Lamar. Your conclusion is great! Mrs. Barnsworth was oblivious of her prejudice in the beginning of her short stay in Coloma, California. However, she had the courage and humility to realize and acknowledge her mistakes. Therefore, I think Mrs. Barnsworth was an abusive woman but now, she has transformed. To start with, she was prejudiced against the miners for having “ugly” skin. She acted sophisticated and treated everyone like they were below her. She was picky and fussy about her accommodations at the Sierra Nevada House. She was bossy and was ordering people around. When Mrs. Barnsworth discovered her diamond bracelet was missing, she raised a raucous over it and wanted to blame someone. So she blamed Chen Ho without any proof. Just because people look or sound different, doesn’t mean they are guilty of wrongdoing. Chen Ho was made to pay for a crime he didn’t commit. Even without knowing much Chinese people, she made an assumption that they were not intelligent. Luella and Pearley set up a trap to catch the real thief who stole Mrs. Barnsworth’s diamond bracelet ; Luella wore her sapphire combs all day so people in town could see it. At night she set her combs next to her window and Pearley kept watch. The thief, who happened to be a raccoon, snatched it and slipped it in a tree. Pearley climbed up the tree and pulled out the diamond bracelet and the sapphire combs.Mrs. Barnsworth had seen the whole thing and realized Chen Ho was innocent, she instantly ran to the jail to apologize and became a changed women. People are judged on how they look and talk. Just like how Mrs. Barnsworth judged Chen Ho, we should not judge Mrs. Barnsworth. Mrs. Barnsworth was prejudiced because in Boston, where she is from, she probably didn't see people of different race. In my opinion Mrs. Barnsworth was a good person who changed, because she was humble enough to acknowledge her mistake. Great job, Anand. I like the idea that we should not judge Mrs. Barnsworth. That would make us like her, and there is a part of her that isn't the most flattering. Great ending to your ideas! I would think that the part where Mrs. Barnsworth has prejudice is not flattering. Did I pass? Great job Anand! I love your proof. In my opinion, Mrs. Barnsworth is a judgmental rich lady. Mrs. Barnsworth is very judgmental because she accused Chen Ho for stealing her diamond bracelet without any accurate proof, and she accused him from the way he looks. Chen Ho was looking at the bracelet because most jewelry is eye catching, and when you see something new you are most likely to stare at it. He also looked at it because diamonds are shiny and fascinating. Mrs. Barnsworth doesn’t let Luella run, and whenever she does Mrs.Barnsworth calls Luella a “mule deer”. When Mr. Barnsworth calls Luella “sweet pumpkin”, Mrs. Barnsworth tells him not to refer her to a garden patch vegetable. Mrs. Barnsworth is a rich lady because Pearley describes her as elegant skin and her hair looks likes gold is spun into it, only rich people can afford beautiful makeup and silky hair. In conclusion, this proves that Mrs. Barnsworth is a prejudice high-class lady. Your topic sentence and your conclusion do well to firmly state your opinion, Daniel. The details also are good proof for the big idea that you have. In the end, do you like Mrs. Barnsworth? I don't like Mrs. Barnsworth because she is very judgmental to people from other cultures, but one thing I do like about her is that she realized her mistake. This teaches us that it's never too late to change your bad attitude. I understand your thoughts about her treatment of other cultures. We have so many great cultures in our class; it would be hard to think of any of us being mistreated. Your lesson at the end of your response above is excellent, Daniel. I like that idea! Hopefully, Mrs. Barnsworth is on her way to a better attitude from her time in Coloma. Mrs. Barnsworth is very judgemental, and she jumps to conclusions, especially people from a different culture than hers. Mrs. Barnsworth accused Chen for stealing her diamond bracelet even though there was no proof that he stole it. She called Chinese people “Celestials.” She spoke rudely to Susan and Pearley. She comes to the conclusion that Chinese people aren’t very intelligent even though she never met a Chinese person. At the end of chapter 9, Pearley noticed Mrs. Barnsworth staring at Chen, “like a cat eyes a mouse right before it pounces.” It seems like she wants to do something bad to Chen. Mrs. Barnsworth is a snob and racist who looks down at everyone and she assumes the worst about Chinese people. Good proof Benjamin! I like your topic sentence and your conclusion sentence. Awesome job, Benjamin! I like it when you said,”Mrs. Barnsworth is a snob and racist who looks down at everyone” I agree with you on that statement. Your blog was filled with proof that supports your topic sentence.Great job! When Mrs. Barnsworth enters the story “The Adventures of Pearley Monroe,” she shows a judgmental, bossy and racist character. Mrs. Barnsworth looks judgmental when she tells the stagecoach driver that Mr. Barnsworth is checking the hotel to see if it’s ‘’suitable.’’ She’s saying that the hotel might not be good enough for her. Mrs. Barnsworth looks bossy when Mr. Barnsworth called their child a “little pumpkin.” And Mrs. Barnsworth tells him “do not call our child some sort of garden patch vegetable, especially not in public.” This seems bossy because Mr. Barnsworth was just being nice. Mrs. Barnsworth looks racist when she says, “Chinese people call themselves celestials and think China is an enchanted city. ” Mrs. Barnsworth thinks that’s a silly thing to believe and she talks about all Chinese are “not very intelligent.” When Chen Ho walked away Mrs. Barnsworth eyed him like a cat eyes a mouse right before it pounces. This shows that Mrs. Barnsworth doesn’t trust Chen Ho. Even though Mrs. Barnsworth shows that she can apologize at the end of Chapter 12, she really looked like a snob when I first saw her in the book. I like the word "bossy." It suits her. Good job! How is Mrs. Barnsworth racist if she says that Chinese people call themselves celestials and think China is an enchanted city? Overall great blog! I like how you said shes a snob, instead of saying mean or rude. Great Job! You do well to give your idea and then support it with text evidence, Jackson. Your selection of details provides good proof of your big idea. It's kind of crazy that Mr. Barnsworth gets "in trouble" for calling his own daughter, pumpkin! Well, it's racist because all Chinese people call themselves celestials and think China is an enchanted city, and she's judgeing every body that believes it. I know Mr. Lamar! Isn't that weird? I guess that's because Mrs. Barnsworth is bossy! My opinion on Mrs. Barnsworth is that she was very mean. I think that she was very mean because she made her husband, Henry Barnsworth, do everything for her. She could do what she made her husband do. Mrs. Barnsworth was basically treating Henry Barnsworth like a slave. Mrs. Barnsworth was not letting her husband call their daughter a pumpkin while Mrs. Barnsworth herself called their daughter a Mule Deer. She accused someone stole something without evidence. Mrs. Barnsworth also did not let her daughter do a lot of things. It would probably be boring for Luella and made her sad. This is why I concluded Mrs. Barnsworth is very mean. A slave? Tell me what you mean by "slave." Great job Bennett! I like the conclusion, it is really strong! You have a nice collection of ideas to show why Mrs. Barnsworth could be considered "mean." Do you think that there are any good parts to the character? Sorry, that was for Bennett! Great work, Kate! I like the word "concluded"! What do you mean by slave?Overall great blog! Mrs. Barnsworth is rude, condescending, superior, and judgmental at the beginning, but as the episode unfolds, we see she can be kind, too. She was rude and condescending when she said to Susan, “Can you fix me a cup of tea? Or should I say, a good cup of tea?” Her adding the word “good”, implies she thought the tea wouldn’t be good, or suitable for her, and it was talking in a condescending way. Also, she said the stagecoach driver should wait to unload their trunks until Mr. Barnsworth checked that the Sierra Nevada House was suitable for her and Luella. She treats Mr. Barnsworth like she and Luella are superior to him. In addition, she said to Luella, “Luella. Mind the sun dear. You don’t want your face to freckle, lest you look like some of the leather-skinned miners we saw as we came through Folsom.” That implies she was judging the miners based on their looks, which is very rude and judgmental. Later in the story, she changed when she said she was sorry for accusing Chen Ho. What she said was,” Please forgive me. I have behaved badly. I have learned an important lesson indeed, and need to make several apologies." That means she hasn’t necessarily changed all the way, but it implies she has made a slight change for the better. Mrs. Barnsworth changed in the middle of chapter 12, but before, she was rude, condescending, superior, and judgmental. Condescending is the perfect word for Mrs. Barnsworth, Bennett. She speaks to people as though she is above them. I agree that her change is slight, but I have hope that when she gets back to Boston, she changes more. Do you think she will? I agree with Mr. La Marr. Also I like your conclusion. Good job! In my opinion, Mrs. Barnsworth will change a small amount more. That could be possible because back in Boston, Mrs. Barnsworth will have more time to think about it and maybe will realize, maybe the people she judged/judges aren’t necessarily what she thinks they are. The reason it would probably be only a small amount of change is because it takes a long time of realization before a tremendous change can happen. I hope she changes too because judging people is rude. GREAT response, Bennett. I agree with you on all accounts. I, too, hope that she will continue to change. Your point of it taking a long time of realization before tremendous change can happen is right on the mark. Impressive thinking here! In my opinion, Mrs. Barnsworth is racist but at the end she apologized. Mrs. Barnsworth was racist when she said that ''Chinese people'' are dumb but they work hard. Saying that ''Chinese people'' are dumb is racist. Mrs. Barnsworth was also racist when she accused Chen Ho for stealing her diamond bracelet. She accused him because he is Chinese. That is racist because Mrs. Barnsworth was accusing Chen Ho by his race. Then when Pearley found proof that the thief was a raccoon. Mrs. Barnsworth apologized to Chen Ho for accusing him for stealing her diamond bracelet. Never judge someone because of their race. Mrs. Barnsworth ended out to be very caring after she apologized to Chen Ho. I like the idea you have of not judging people based on race. If the world could work that way, I think many problems would disappear. You have some good thoughts in here, Devin. I like how you used the word "accusing." Great Blog! Mrs. Barnsworth is a very rude lady. In my opinion she is rude,because she is harsh and treats Mr. Barnsworth and other people badly.For example when Mr. Barnsworth called Luella "pumkin", Mrs. Barnsworth got really upset and said "do not refer to our child as some sort of garden patch vegetable, especially not in public." I don't think that calling a child "pumkin" is referring to them as a piece of a vegetable garden. I also feel she is rude because she was discriminating against the Chinese culture by saying "I can't imagine that they are very intelligent, but at least they are hard workers." She also accused Chen Ho (a Chinese boy) of stealing her jewelry without any proof. In fact it turned out to be a raccoon.I don't think that Mrs. Barnsworth will change. She never seems to actually apologize for her rude behavior. I agree with you about your thoughts of Mr. Barnsworth and the use of the term "pumpkin," Andrew. If you think that Mrs. Barnsworth didn't "actually apologize," what do you feel she was doing at the end of the episode? I'm curious about your idea. My opinion of Mrs. Barnsworth is that she is a Snob. On page 66, Mrs. Barnsworth calls out to Luella “Stop talking to that stable boy” because she doesn’t want Luella talking to “lowly” people. Lowly because she judges everyone on how much money they have. Also, she accused Chen Ho, a Chinese 12 year old, of stealing her diamond bracelet and Sheriff Larkin sent Chen Ho to jail. Mrs. Barnsworth didn’t care because she thought Chen Ho was just another lowly person with barely any relatives or money. Mrs. Barnsworth talks to everyone as if they are lowly and I would not want to be judged on how much money I have. Everyone is a snob once in a while and when you are a snob you make bad judgement of people and I think Mrs. Barnsworth is one of these people. Great job Rayhan! I like your topic sentence and conclusion. Good work!